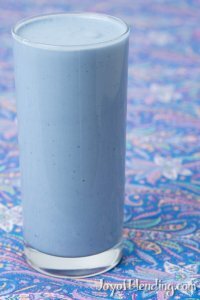 A few years ago I tried to create a naturally blue smoothie. However, it was only blue if it had an unpalatable amount of baking soda in it. 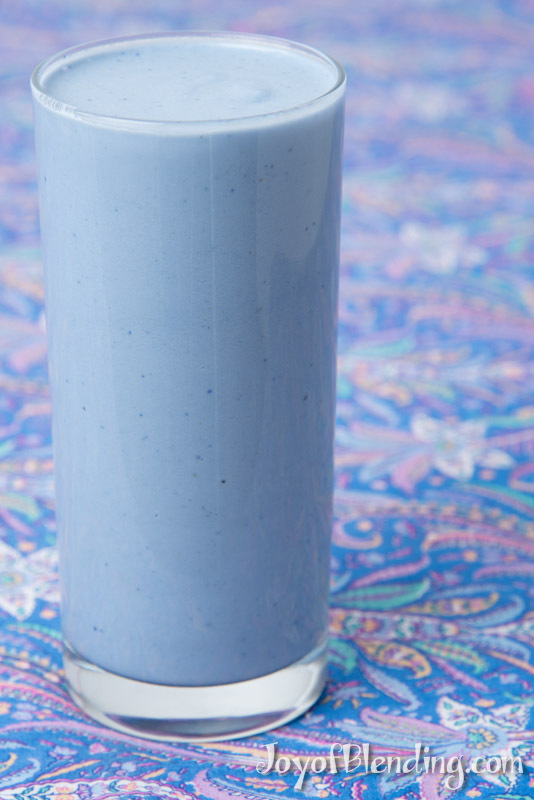 Over the past year, I’ve seen multiple naturally blue smoothies show up online with two different blue ingredients: butterfly pea flowers and a spirulina blue-green algae extract. 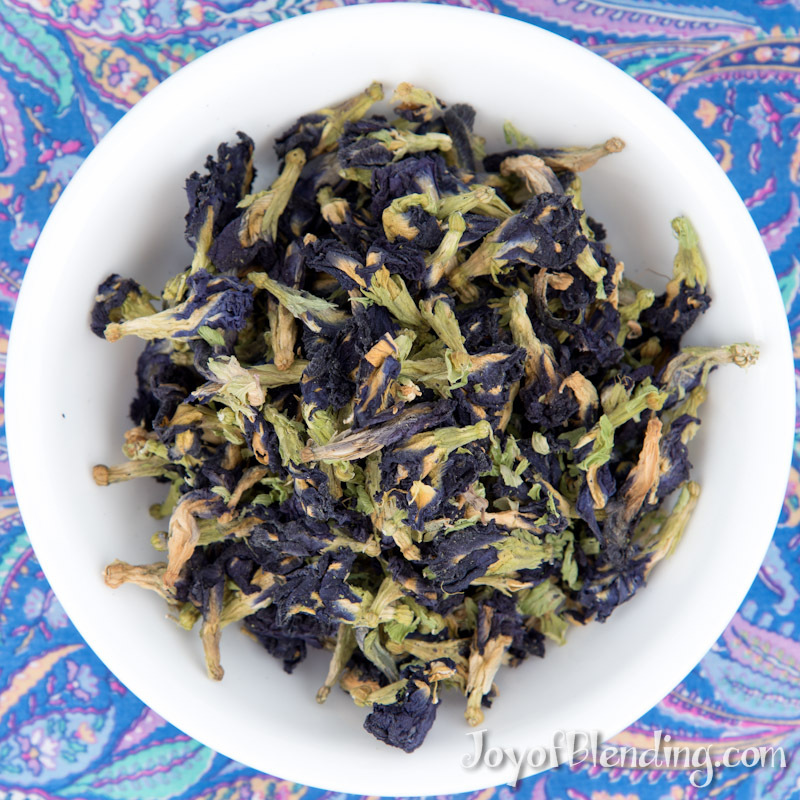 The butterfly pea grows in Southeast Asia and has edible blue flowers. People there have used it for tea and blue rice for ages, but now, thanks to the internet, the rest of the world can enjoy it. 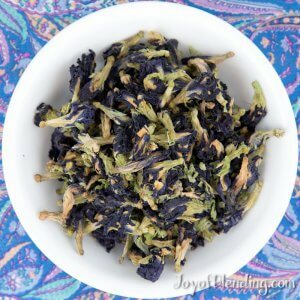 I was surprised to find dried butterfly pea flowers for under $4, including shipping from Thailand(! ), so I had to order some. The butterfly pea flowers don’t taste like much, so they pretty much just add color. The blue extract of spirulina blue-green algae is much more expensive, and I haven’t tried it. To be fair, the extract is more concentrated than the flowers. But, for me, this is a novelty and not worth spending over $60 on. Also, once you get into powdered extracts, it seems like that’s getting close to just adding food coloring, which I initially deemed cheating. (You could argue that adding flowers just for coloring is also not so different from adding food coloring, but at least they are a whole food.) I’ve read that the algae powder tastes a bit like pond scum, which is essentially what it is. Like many pigments, the color of the butterfly pea flowers depends on pH. Just like purple cabbage and blueberries, it turns from blue to greenish at high (basic) pH, and to purple and pink at low (acidic) pH. However, fortunately for the blue smoothie quest, unlike purple cabbage and blueberries, the butterfly pea flowers are blue in the neutral pH range. To get the smoothie to come out blue, you need to avoid other strong colors. 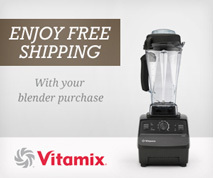 So you want ingredients with a light and neutral color. I went with coconut, but other possibilities are pear and the ingredient that will not be mentioned on this site. Then you also need to avoid too much acidity, which would shift the color to purple. Crack open the coconut over a bowl to catch the coconut water. I used a hammer. Cut out the white flesh, and put it in the blender along with the coconut water and other ingredients. For a finer blend, add the ice after blending the other ingredients. (That keeps the coconut oil from solidifying during blending.) If you want to completely remove the fibrous texture, you can squeeze the blend through a filtration bag, but the traditional version leaves in the fiber, and I didn’t filter mine. Cool! Apropos of your quest, you might find this entertaining: http://imaginemdd.blogspot.com/2014/01/blue-food-dinner-party-joke-so-nice.html . On a more serious note, do you suppose the flowers are pesticide-free? Interesting… Something tells me Hitchcock wasn’t using natural blue coloring though. The flowers are sold as food and are allegedly organic, so, that should allay some fears. As a sometimes novelty, I’m not worried about pesticides one way or the other. I think it’s a safe bet that no natural colors were involved with the blue dinner! I remember, as a kid, his talking about it during the course of a TV interview so I was pretty confident that a search would turn up the story. That color is bluetiful – I LOVE it!!! In the 4th paragraph you have pH and acidity reversed. Low pH = acid and high pH = alkaline. Thanks! I just fixed it.